Om Prakash Puri, OBE (18 October 1950 – 6 January 2017) was an Indian actor who appeared in mainstream commercial Hindi Films, as well as independent and art films. He is best known for his author-backed roles in films like Aakrosh (1980), Arohan (1982), Ardh Satya and television films like Sadgati (1981) and Tamas (1987) and also light-hearted roles in Jaane Bhi Do Yaaro (1983) and Chachi 420 (1997). He had various collaborations with director Shyam Benegal and Govind Nihalani. Puri also appeared in non-Indian productions in the United States, Britain and Pakistan. Puri was awarded Padma Shri, the fourth highest civilian award of India, in 1990; and in 2004, was made an honorary Officer of the Order of the British Empire. Om Puri was born in Ambala in a Punjabi Hindu family. His father, Rajesh Puri, worked on the railways and in the Indian Army. As he had no birth certificate or records, his family was unsure of his date and year of birth, however his mother told him he had been born two days after the Hindu festival Dussehra. When he began his schooling, his uncle chose 9 March 1950 as his "official" birthday, however as an adult when he moved to Mumbai, Puri looked up when Dussehra was celebrated in 1950, to establish his date of birth as 18 October. Puri came from an underprivileged background. When he was six years old, his father who was a railway employee was put behind bars on allegations of theft of cement. This resulted in their family becoming homeless. To make ends meet, Puri's brother, Ved Prakash Puri, worked as a coolie (railway porter) and Puri worked in a local tea shop,  did odd jobs, and collected coal from nearby railways tracks to support his family. He and his brother's children were later brought up by a maid servant, Shanti. While working, Puri continued to study. After his primary education, he joined the National School of Drama in Delhi to study theatre acting. A fellow NSD student who became a long-term friend, Naseeruddin Shah, encouraged Puri to follow him to the Film and Television Institute of India in Pune. In an interview with The Times of India, Puri later recounted his family was so poor that he did not have a decent shirt to wear when he joined FTII. According to Shah, Puri was disappointed by his education at FTII, and also was unable to pay tuition fees—when he became well-known, the institute followed up the debt of Rs 280, which Puri refused to pay due to the "impish thrill" of owing them money. Puri's first film was Chor Chor Chhup ja, a children's film. During this time, to make ends meet he also worked at the Actors' Studio, where future actors such as Gulshan Grover and Anil Kapoor would be his students. Subsequently, Puri worked in numerous Indian films, as well as many films produced in the United Kingdom and the United States. Puri made his debut in the mainstream films genre in the 1976 Marathi film Ghashiram Kotwal, based on a Marathi play of the same name by Vijay Tendulkar. It was directed by K. Hariharan and Mani Kaul in cooperation with 16 graduates of the FTII. He has claimed that he was paid "peanuts" for his best work. Along with Amrish Puri, Naseeruddin Shah, Shabana Azmi and Smita Patil, he was among the main actors who starred in what was then referred to as art films such as Bhavni Bhavai (1980), Sadgati (1981), Ardh Satya (1982), Mirch Masala (1986) and Dharavi (1992). He was critically acclaimed for his performances in many unconventional roles such as a victimized tribal in Aakrosh (1980); Jimmy's manager in Disco Dancer (1982); a police inspector in Ardh Satya (1982), for which he got the National Film Award for Best Actor; a humble husband in Seepeeyan (1984), Vinod's uncle in Zamana (1985 film) the leader of a cell of Sikh militants in Maachis (1996); as a tough cop again in the commercial film Gupt in 1997; and as the courageous father of a martyred soldier in Dhoop (2003). In 1999, Puri acted in a Kannada film A.K. 47 as a strict police officer who tries to keep the city safe from the underworld—it became a huge commercial hit. Puri's acting in the film is memorable. He rendered his own voice for the Kannada dialogues. In the same year, he starred in the successful British comedy film East is East, where he played a first-generation Pakistani immigrant in Northern England, struggling to come to terms with his far more westernised children. Puri had a cameo in the highly acclaimed film Gandhi (1982, directed by Richard Attenborough). In the mid-1990s, he diversified to play character roles in mainstream Hindi cinema, where his roles are more tuned to mass audiences than film critics. He became known internationally by starring in many British films such as My Son the Fanatic (1997), East Is East (1999) and The Parole Officer (2001). He appeared in Hollywood films including City of Joy (1992), opposite Patrick Swayze; Wolf (1994) with Jack Nicholson; and The Ghost and the Darkness (1996) opposite Val Kilmer. In 2007, he appeared as General Zia-ul-Haq in Charlie Wilson's War, which stars Tom Hanks and Julia Roberts. He has worked in Hindi television serials like Kakkaji Kaheen (1988) (roughly meaning "Uncle Says") as a paan-chewing 'Kakkaji', which was a parody on politicians, and Mr. Yogi (1989) as a suave 'Sutradhaar' who enjoys pulling the protagonist's leg. These two serials underlined Om Puri's versatility as a comedian. He received critical acclaim for his performance in Govind Nihalani's television film Tamas (1988) based on a Hindi novel of the same name. He played comic roles in Hindi films like Jaane Bhi Do Yaaro which reached a cult status, followed by Chachi 420 (1997), Hera Pheri (2000), Chor Machaye Shor (2002), Deewane Hue Pagal, Chup Chup Ke, Kismet Connection and Malamaal Weekly (2006) and Oh My God. He was regular in films directed by Priyadarshan and Kamal Haasan. His notable roles in commercial Hindi films included Drohkaal, In Custody, Narsimha, Ghayal, Mrityudand, Aastha, Hey Ram, Pyar Toh Hona Hi Tha, Farz, Gadar, Lakshya, Dev (2004), Rang De Basanti, Yuva, Singh Is Kinng, Mere Baap Pehle Aap, Billu, Kyunki, Lakshya, Dabang, Bhaji In Problem, Khap, Bajrangi Bhaijaan, Ghayal Once Again. Puri was seen in the role of Mohammad Ali Kasuri in Road to Sangam (2009). In 2010, he appeared in The Hangman. In 2011 he was in the Indian action film Don 2. He has also worked in some episodes of the TV series Aahat during the second season which was aired between 2004 and 2005 on Sony channel. Other notable television appearances included Bharat Ek Khoj, Yatra, Mr. Yogi, Kakaji Kahin, Sea Hawks, Antaral and Savdhaan India's second season. In 2014, he appeared opposite Helen Mirren in the comedy-drama The Hundred-Foot Journey. At the time of his death in January 2017, he was working on the Marathi film, 15 August Bhagile 26 January. Several of his completed films released after his death including Viceroy's House and Tubelight. Puri married Director/writer Seema Kapoor, the sister of actor Annu Kapoor, in 1991, but their marriage ended after eight months. In 1993, he married journalist Nandita Puri, with whom he had a son named Ishaan. In 2009, Nandita wrote a biography of her husband titled Unlikely Hero: The Story Of Om Puri. Upon the book's publication, Puri spoke of his anger at the inclusion of explicit details of his previous relationships. In 2013, Nandita filed an allegation of domestic violence against him, and the two opted for a judicial separation shortly afterwards. His second wife reported that they kept a "secular house", but that "while Om is not ritualistic, he does not mind others being so". He took "solace in spiritual reading", particularly in the writings of spiritual teacher Eknath Easwaran, many of whose books he shared with friends. Puri seldom took politics seriously, and often found relaxation by cooking or gardening. In an interview to Rajya Sabha TV in 2012, Om Puri spoke about his interest in agriculture and cooking, and suggested that his dream was to open a dhaba by the name Dal Roti. On 6 January 2017, Puri died at the age of 66, after having a heart attack at his residence in Andheri, Mumbai. He was honoured at the 89th Academy Awards in memoriam segment for his contribution in Indian and world cinema. ^ a b Gulzar, Saibal Chatterjee (2003). Encyclopaedia of Hindi Cinema. Publisher Popular Prakashan. p. 606. ISBN 8179910660. Retrieved 6 January 2016. ^ Kumar, Anuj (10 April 2014). "Blast from the past - Aakrosh (1980)". The Hindu. ^ a b "Padma Awards Directory (1954–2014)" (PDF). Ministry of Home Affairs (India). 21 May 2014. p. 98. Archived from the original (PDF) on 15 November 2016. Retrieved 22 March 2016. ^ a b "Indian actor Om Puri awarded OBE". British Broadcasting Corporation. 23 July 2004. ^ "Rediff On The Net, Movies:An interview with Om Puri". rediff.com. ^ Puri, Nandita (2009). Om Puri: Unlikely Hero. Roli Books. ISBN 9351940756. ^ a b "Did you know? Om Puri ran a chai kiosk in his childhood". Dawn. 19 December 2015. Retrieved 11 January 2017. ^ Panchal, Komal (6 January 2016). "RIP Om Puri: His journey from rag picking to cinematic success". The Indian Express. Retrieved 11 January 2017. ^ a b Jhal, Subhash (11 November 2009). "My wife made me look cheap: Om Puri". The Times Of India. Retrieved 11 January 2017. ^ "NSD Graduates" (PDF). National School of Drama. Retrieved 6 January 2016. ^ "He was too quiet, reserved for an acting student: FTII batchmates remember Om Puri". The Indian Express. 7 January 2017. Retrieved 7 January 2017. ^ "Om Puri, celebrated Indian actor, dies at 66". The Guardian. 6 January 2017. Retrieved 7 January 2017. ^ a b "Veteran actor Om Puri passes away, Bollywood mourns his demise". The Times of India. 7 January 2017. Retrieved 7 January 2017. ^ a b "The legacy of Om Puri". The Week. 6 January 2017. Retrieved 7 January 2017. ^ "Om Puri dies of heart attack at 66". Livemint. 6 January 2017. Retrieved 7 January 2017. ^ Pal, Divya (31 July 2014). "Om Puri earns 15-25 lakh not a crore for a film; does Bollywood have an age bias?". News18. Retrieved 6 January 2016. ^ a b c "Om Puri: Veteran Indian actor dies at the age of 66". BBC. 6 January 2017. Retrieved 7 January 2017. ^ a b c d "In Om Puri, we witnessed one of the finest, most versatile shape-shifters of our times". The Economic Times. 7 January 2017. Retrieved 8 January 2017. ^ "Om Puri: Acting giant who traversed both East and West". Business Standard. 6 January 2017. Retrieved 8 January 2017. ^ a b c d e f "Om Puri: The actor who never got his due". BBC. 6 January 2017. Retrieved 7 January 2017. ^ a b c d "Om Puri: An Acting Giant Of Parallel And New Wave Cinema". Huffington Post. 6 January 2017. Retrieved 8 January 2017. ^ "Om Puri returns to TV with crime show". Hindustantimes.com. 24 July 2012. ^ "Om Puri's 'Marathi debut' - Times of India". ^ "Om Puri to star in his first wife Seema Kapoor's film". Mid-Day. 31 August 2016. Retrieved 6 January 2017. ^ "The Om Puri Story: A marriage on the rocks, a son caught in the middle and old lovers". m.indiatoday.in. Retrieved 6 September 2016. ^ "Om Puri passes away after a massive heart attack". The Indian Express. 6 January 2017. Retrieved 6 January 2017. ^ "My wife made me look cheap: Om Puri". Times of India. 11 November 2009. Retrieved 6 January 2017. ^ "The Om Puri Story: A marriage on the rocks, a son caught in the middle and old lovers". India Today. 28 August 2013. Retrieved 6 January 2017. ^ a b c d Puri, Nandita (9 January 2017). "Om Puri, Through The Eyes Of His Former Wife". Outlook. Retrieved 6 January 2017. ^ "Om Puri passes away after a massive heart attack". indianexpress.com. Retrieved 6 January 2017. ^ "Veteran actor Om Puri passes away". ThisHour.in. Retrieved 6 January 2017. ^ "Indian actor Om Puri dies aged 66". BBC News. 6 January 2017. ^ "Academy Awards 2017 Pay Tribute To Om Puri, Actor Mentioned In 'Memorium' Segment At Oscars". indiatimes.com. Retrieved 28 February 2017. ^ "Om Puri to play Bal Gangadhar Tilak onscreen". Hindustantimes.com. 17 February 2015. Retrieved 30 July 2015. ^ "Patiala-born filmmaker to discuss her new Partition film in NY - Times of India". ^ "A Million Rivers". 18 June 2011. ^ "Priyanka Chopra, Irrfan and Om Puri roped in for The Jungle Book". ^ "Om Puri's first Pakistani film to release on Eidul Azha". The Express Tribune. Retrieved 11 January 2016. ^ Chadha, Gurinder (6 January 2017). "Om Puri remembered: a man of wit and compassion who put a human face on a label" – via The Guardian. ^ a b c d e "Actor Om Puri no more; 5 TV series where he stole the show with his incredible talent". Retrieved 6 January 2017. ^ "Gulzar to be seen in a prime time serial 'Kirdar'". 31 October 1993. Retrieved 20 March 2018. ^ "29th National Film Festival (1982)" (PDF). Directorate of Film Festivals. p. 10. Retrieved 30 July 2011. ^ "31st National Film Festival June 1984" (PDF). Directorate of Film Festivals. p. 12. Retrieved 30 July 2011. ^ "Om Puri to get lifetime achievement award at International Film Festival of Prayag". Indian Express. 16 December 2014. Retrieved 6 January 2017. ^ "Bafta nominations in full". BBC. 1 March 2000. Retrieved 6 January 2017. ^ Anu, James (14 March 2017). "IIFA Utsavam 2017: Malayalam nomination list out; Maheshinte Prathikaram and Charlie in stiff competition". IB Times. Archived from the original on 30 March 2017. Retrieved 31 March 2017. 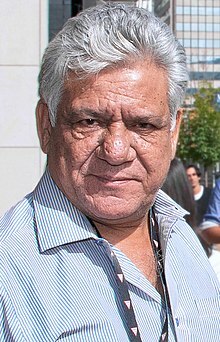 Wikimedia Commons has media related to Om Puri. Veteran actor Om Puri passes away, Bollywood mourns his demise - The Times of India, January 6, 2017.